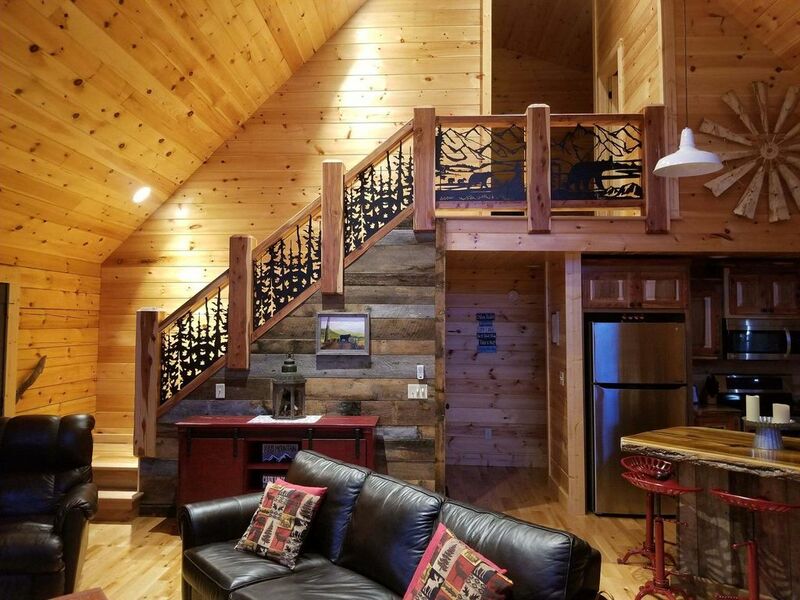 Lucky to be View 2 is a newly built cabin that is conveniently located between Gatlinburg and Pigeon Forge. Just 1.5 miles off the parkway. This is a beautiful 3 bedroom cabin with a great view of Mount Leconte. When you enter the cabin you will find a large rustic kitchen and a huge rustic island that seats 6. There is also a large farm table to dine at and enjoy the view. When you walk into the living room you will find an extra large leather sofa and recliner to relax in. You can snuggle up next to the real river rock fireplace and enjoy the warmth from the gas logs, while watching the 55" tv. You can also take in the majestic views from the large glass windows. The side porch offers rocking chairs and a hot tub with a mountain view. The front porch has a sitting area to enjoy a wooded area. The main floor has a king-sized bedroom with a tv, sitting area and a closet. Upstairs there are 2 joining bedrooms with a queen bed and a bunk bed (full over full).These bedrooms are not separated with walls, which makes a huge open space to sleep and view the mountains from the loft area. Both beds have a tv to watch (one with cable, one with dvd player). During your stay you will enjoy practical amenities including a washer/dryer and a BBQ grill. Unlimited Wifi and excellent cell phone service is provided in your cabin so you can stay in touch with the outside world and research new adventures to do while on vacation! We loved staying here for our kids spring break! Super cute and cozy cabin. Close to everything, but tucked away enough for relaxation and great views. The only thing we could’ve asked for was a bigger grill, but we already look forward to planning another vacation here! We had a girls weekend and were thrilled with the location of this cabin. Everything was clean and comfortable. Fireplace was cozy and the hot tub was relaxing. The only thing I would recommend would be to add a few more mirrors. With three girls getting ready there was only one full length mirror in a tight spot and none in either bedroom. Other than that it was a great weekend. Thank you!! Took our family of 5 here on vacation. Not only is this place amazing inside and out, the views and location are perfect. Right between gatlinburg and pigeon forge. Don’t hesitate on booking this beautiful cabin. WE LOVED IT!!!! Beautiful cabin with INCREDIBLE views. Our trip was a getaway our boss paid for. It was 3 co-workers just getting away for the weekend. Had a nice weekend. The location is perfect. Everything was clean and well decorated, would definitely recommend. We enjoyed our time at this lovely cabin. The views are great and could not have imagined a more perfect place to stay!